<< Thomas Miles Richardson, Snr. 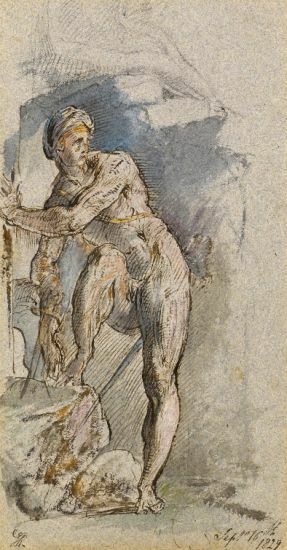 This early drawing by Richmond dates from September 1829. In November 1829, Richmond drew his famous miniature of Samuel Palmer (see no.20) with a beard and long flowing locks (National Portrait Gallery, see Samuel Palmer – Vision and Landscape, exhibition catalogue 2005, no. 54, p. 129, ill.). Palmer was one of Richmond’s closest friends and they had spent the summer of 1827 together at Shoreham. Richmond’s subject matter at this period is often religious or mystical and it wasn’t until 1832-33 that he concentrated on portraits for which he became best known. 19.8 by 15.3 cm., 7 ¾ by 6 in. James S. Dearden, John Ruskin – A Life in Pictures, 1999, pp. 49-51, no.42, ill. 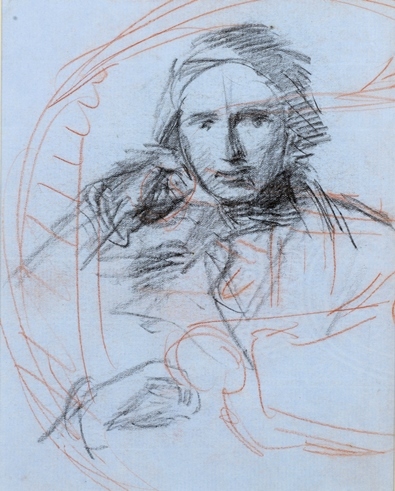 This study relates to a portrait by Richmond of Ruskin dating from 1857 when Ruskin was 38. The artist and sitter had originally met in Rome in 1840 and were close friends afterwards. Ruskin liked Richmond who `confirms my first impression of him. He is a most gentlemanly man, and of fine mind’ (quoted in Dearden, op. cit., p.28). In February 1857, Ruskin’s father John James suggested that Richmond paint his son in watercolour and Richmond accepted the commission on 5th February. 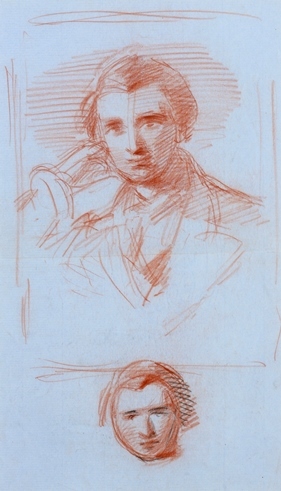 There were seven sittings for the portrait between 24th February and mid March of which these sketches were the result. The portrait was finished on 28th March at a cost of £42 and John James Ruskin also sent Richmond a case of wine as thanks. He was evidently pleased with the portrait as he had it engraved by Francis Holl the following year. The portrait hung at Brantwood, Ruskin’s home at Coniston, until the dispersal sale there in 1931 where it was bought by the American bookseller Charles Goodspeed, but was later destroyed in a fire. Holl’s engraving is a record of the portrait which has the same pose as the current drawings. Richmond also drew a head study of Ruskin in chalk at around this date which remained in the artist’s collection until his death when it was bought by the National Portrait Gallery. He had also drawn James John Ruskin in 1848. 31.2 by 18 cm., 12 ¼ by 7 in. James S. Dearden, John Ruskin – A Life in Pictures, 1999, pp. 49-51, no.41, ill.
52.8 by 38 cm., 20 ¾ by 15 in. The sitter is the Hon. 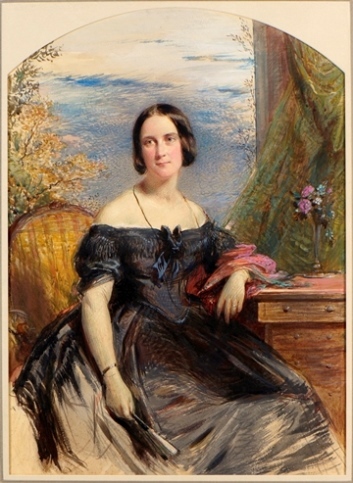 Anne Wood (d.1863), the daughter of Sir Francis Lindley Wood, 2nd Bt. and Anne Wood. She married John Walbanke-Childers (1789-1886), MP for Cambridgshire and Malton. According to Richmond’s accounts, this portrait, listed as of `Mrs W. Childers’, was begun in 1843 and completed after the sitter’s death in 1864. It was sold for the large sum of £52. Richmond painted mainly landscapes and miniatures in the 1820s when he befriend Samuel Palmer and the Ancients as well as William Blake, but concentrated on portraits in watercolour or coloured chalks on brown paper from the early 1830s. Huon Mallalieu describes the former as `..portraits in watercolour of a particular delicacy and brilliance…’ and `quite the best portraits of the time in watercolour, showing rapidity and sureness of handling and a strong sense of the character of the sitter as well as his likeness (Huon Mallalieu, The Dictionary of British Watercolours Artists up to 1920, 2002, vol. II, p.129).